Question: It's quite cool for 6 months of the year where I live. What bonsai tree types are best for cold climates? Answer: If you live in a Northern location, it is best to use bonsai tree types that are classified as “cold-hardy”. Many tropical trees cannot be grown in northern climates unless you have the proper indoor environment since the cold weather can be damaging to these species. For the best chance of success, you should choose a plant that grows naturally in your local climate or choose one that is able to survive severe winters. Most cold-hardy varieties need full change of seasons in order to thrive since they require a winter dormancy period. Many of these species cannot be grown indoors and should be kept outside or in a cool protected environment all-year round. If you live in an area that does not get extreme winter weather (temperatures that do not fall lower than 25 degrees Fahrenheit, or -4 degrees Celsius) then you have the option of choosing temperate climate trees such as Junipers, Boxwoods, Cotoneasters, Yews, or Roses. Maples: Many species of maples are indigenous to northern climates and are ideal for outdoor and cold weather bonsai. The Amur Maple is especially popular as it can survive temperatures as low as -49 degrees Fahrenheit (-45 degrees Celsius) and is also very fast growing during the warmer seasons. The Field or Hedge Maple is also a good cold-climate bonsai choice. Elms: Many species of Elms are used to cold weather climates, but the Siberian Elm is very popular among bonsai growers as it is a good alternative to the more temperate Chinese Elm. Pine: Again, many pine tree varieties can survive extreme winter weather so you will have several to choose from. The Mugo Pine, also known as the Swiss Mountain Pine, is an ideal alternative to the Japanese Pine. Larch: This coniferous tree is native to the northern hemisphere and is the only evergreen tree to lose its needle-like leaves each autumn. Spruce: Most Spruce tree varieties prefer cooler climates, although the degree of cold that can be tolerated varies depending on the species. The Norway Spruce and Alberta Spruce are the most common choices. Cedars: There are a wide variety of cedars, but some are not very cold tolerant and prefer a more temperate winter environment. The best choices for cold-climate bonsai include the Eastern Red Cedar, the Eastern White Cedar, and the Lebanon Cedar. Birch: Birch trees are a popular bonsai choice because they are quick growing and possess beautiful white peeling bark. While a few species prefer more temperate climates, most Birch varieties like colder climates. Sargent Crabapple: Growers looking for a flowering fruit tree that will survive cold winters will find their answer in the beautiful Sargent Crabapple. 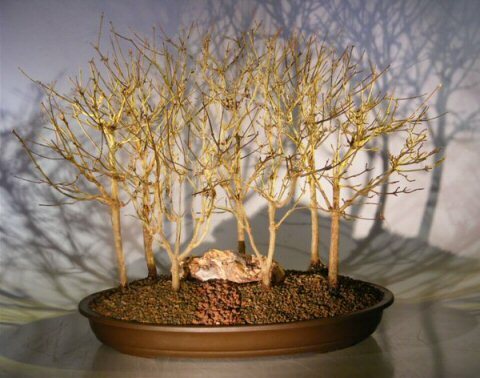 Hornbeam: Cold hardiness varies depending on the variety, but the American Hornbeam is the best option for cold-climate bonsai. Cypress: Cypress trees grow naturally in several different parts of the world and not all varieties are cold-hardy. The Emerald Isle and Blue Moss Cypress are ideal cold-climate bonsai choices. Even though your tree is cold-hardy, it will still require special care during the Winter months. When a tree grows in nature, its roots are usually quite deep and protected by the soil. Since your bonsai is typically planted in a shallow container with limited soil, it is more vulnerable to damage caused by colder temperatures. By following the proper procedures, most cold-climate bonsai can survive the harsh elements quite successfully. 1. During the warm part of the year, from about May to mid-November, your bonsai should be kept outdoors in conditions specific to your species. 2. Stop fertilizing your tree in late August to allow the plant to begin preparing for its dormant period. Once your tree has lost all its leaves and has become fully dormant, it can be moved to its winter location. 3. This is a good time to examine your plant for any signs of pests or disease. A tree that is allowed to winter in these conditions will likely begin its Spring growing season with problems. 4. You can move your bonsai to a cool, dark location such as an unheated basement, garage, cold-frame, or an unheated shed or greenhouse. If you have a very cold-hardy species that is quite mature, you may also over-winter you plant outdoors as long as you provide proper protection. Find a sheltered area out of direct sun and wind, and place your tree in a deep hole. Make sure to bury the entire pot and soil, then cover the area with a thick layer of mulch. Water well and leave until Spring. Do not fertilize trees during dormancy! 5. Trees that are kept in a covered location must be checked regularly to see if they need water. During dormancy, plants require less moisture, but you should check the soil about once a week just to make sure it is not too dry. Trees that are left outside typically do not need to be watered throughout the Winter since the ground is usually frozen. However, if a brief thaw is experienced, it is a good idea to check the soil conditions to see if watering is necessary. 6. Try to keep indoor storage areas between 20-50 degrees Fahrenheit (between -6 and +10 Celsius) as this provides the ideal conditions for dormancy. If possible, do not allow the temperature to regularly fluctuate between colder and warmer conditions as this can cause the plant to come out of dormancy early. Continual thawing and refreezing can also cause damage to the tree. In other words, it is alright for your tree to remain in an environment that is either below freezing or above freezing (but below 50 degrees), but it should not fluctuate between these two conditions. 7. It is not necessary to provide light, as your tree will not require any as long as the temperature remains below 50 degrees Fahrenheit and the plant is still in dormancy. Once the temperature rises and the plant begins to awaken, you must move it to a well-lit location and begin watering regularly. If you live in a colder climate, you can still enjoy the art of bonsai, you just have to make sure that you choose the proper bonsai tree types for your location! Join in and write your own page! It's easy to do. How? Simply click here to return to How to Bonsai Forum.